What Pushed Anders Behring Breivik Over the Edge? Watching the international media on the web and TV change gears Friday, as information started to fasten to the fact that the worst terrorist act in Scandinavia since the 3rd Reich was perpetrated by a right-wing Christian zealot, was fascinating. This, rather than what Pam Geller, Steve Emerson, Daniel Pipes, Dennis Prager, David Horowitz, CNN, Fox News and many others were touting for hours as most likely an act of Muslim Jihad in a country that is way, way too liberal. During the second day of Labour Youth League summer camp at Utøya got the Labour Party’s young hopefuls visit by Foreign Minister Jonas Gahr Store. Together with the Norwegian Broadcasting Corporation correspondent Sidsel Wold and Norwegian People’s Aid Kirsten Belck-Olsen, discussed the Foreign Minister of the deadlock between Israel and the Palestinian Authority. As foreign minister arrived Utøya he was met with a demand from the AUF that Norway must recognize a Palestinian state. 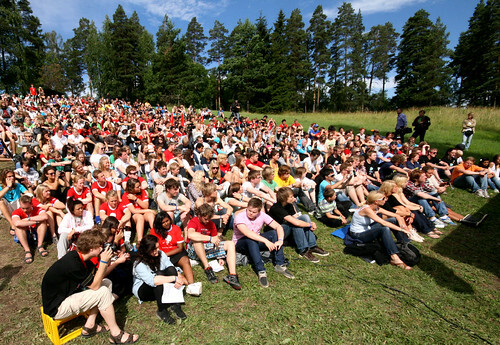 That was an event held Thursday at the summer camp for the children of Norwegian liberals. As the story developed Friday, almost every news outlet was quick to provide experts on Muslim terrorism and how that might have a growing negative impact on Norway and Europe. On Anderson Cooper, Friday afternoon, as he had his experts on Jihadism on camera, he was being told by another person – a CNN reporter – that the shooter, possibly the bomber, was a blond Norwegian. Cooper seemed to be taken aback, turning back to his Jihad experts, who were dismissive of the new information. The bombing-shootings took up enormous bandwidth in our media machine until it came out that the alleged perpetrator has more in common with Sarah Palin and Alan Dershowitz than with Rachel Corrie or Furkan Doğan, both of whom have been labelled terrorists by Dershowitz. As the end-of-the-week-in-midsummer stupor overtakes the media on a hot Friday evening in the USA, will they get around to trying to find out what set Anders Behring off? The bombing had to be pre-planned, probably for some time. Was the pro-Palestinian event Thursday at the camp where over 70 were killed published on the web, facebook, twitter or somewhere else? Most likely. That may be what pushed this guy’s last button. And just who created the group that fictitiously took credit for the massacres early Friday? The ‘Helpers of Global Jihad’ group, of which al-Nasser is a member, made the claims in an email circular issued to various sources. The group does not appear to have any past history. It is thought that the bombings are a belated response to Norwegian newspapers and magazines republishing cartoons of Mohammed originally published by Jyllands-Posten of Denmark. I’m not about to go all conspiracy theory on this story. I am bothered, though, that the media was extremely rapid to ramp up the radical Islam run amok meme, yet so unready to deal with what is increasingly appearing to be possible – that the Christian gunman was impelled to kill liberals he may have felt were too sympathetic to Palestinians. This diary questions what pushed Breivik over the edge. Phoenix Woman’s diary this morning, He’s Not a Terrorist – He’s a Freedom Fighter! touches upon some of the more pathetic errors in the media on Friday, as accurate information on the shooter-bomber became available. 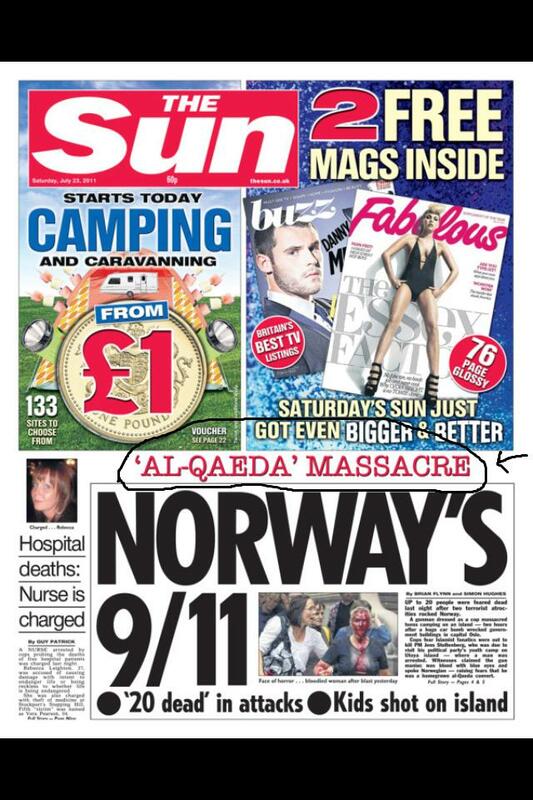 David Dayen’s front page fdl diary, takes this subject further – Norway Terror Reveals Disturbing Assumptions About Muslims.